This page is dedicated to the memory of Heinz Oswald, who lost his life under tragically circumstances at Kho Phi Phi on December 26, 2004. Richelieu Rock with the yacht Excalibur of Heinz Oswald - Moskito Diving. Charly was one of the first divers, who discoverd Ghostpipefishes at Ko Pee Pee Lae. 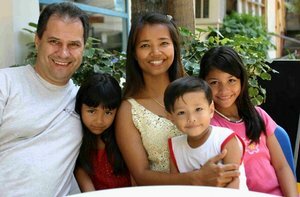 Heinz planed to stay in his house at Phuket to spend more time with his family. They just missed the morning ferry to Phuket because the children dawdled a little bit to long. While waiting for the next ferry-boat a 4-5 metres tall Tsunami-wave from Tonsai-bay devastated Phi Phi Village. On the run with his wife and his children Heinz was caught by a second Tsunami-wave from shallow Lodulum-bay - almost twice as high as the first wave. Phi Phi Village was wiped out. Heinz and his two daughters Tina and Anna lost their lifes together with about 2000 others on the island and 280 000 in the region. His wife Oiy and his son Dino survived the disaster.